The Swimsuit Junction at 29 Alden Street has opened its doors, just in time to take advantage of the warm weather. The store is owned by Debra Bianco, Robin Bachofen, and Maria Sterusky. Debra has lived in Cranford since she was 12 and knew that when she opened her own business it would be in Cranford. The business partners felt that the area could use a store dedicated to swimwear and swim accessories. Debra was in contact with the building’s owners, and once the space became available they jumped at it. 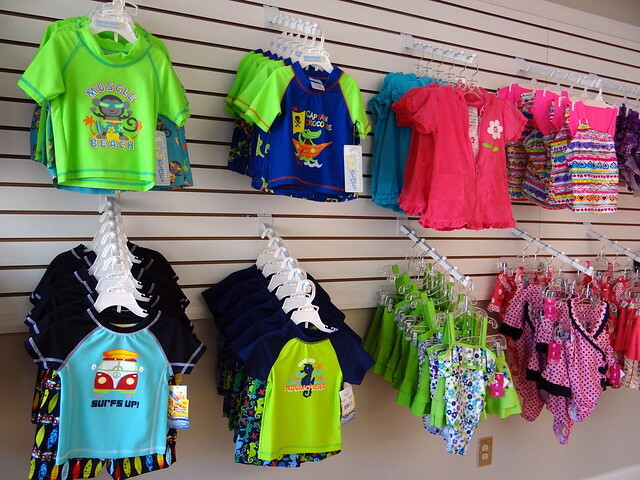 The store stocks a variety of swimwear for everyone from infants to adults. It also has plus sizes for women, and big and tall sizes for men. Debra stresses that one of the advantages of their local business is the personal service. The store has two dressing rooms and can also order sizes if they don’t have it in stock, often receiving it within 48 hours. The Swimsuit Junction plans to expand their offerings as the season progresses. They will be offering maternity swimsuits as well as resort wear, including flip-flops, beach bags, and sundresses. During the winter months the store will cater to snowbirds with cruise wear, luggage, and overnight bags. The swimsuits currently being offered are of high quality, but also priced affordably. Swimsuit Junction plans to bring in a designer line so there will be price points for a variety of customers. In the short amount of time that Swimsuit Junction has been open, the owners are already thrilled with the response. The recent Sip & Shop, sponsored by the Junior Woman’s Club, was very successful. The store has brought in customers due to word of mouth, foot traffic, and promotion on the Downtown Cranford Facebook page. In the near future the owners plan to have an e-commerce website and social media presence. Right now Debra, Robin, and Maria are focused on serving their customers well with high quality swimwear, suitable for the entire family. Stop by and outfit the family for summer fun! Previous Downtown Cranford Is One Stop Shopping for Mother’s Day!